Netflix TV shows and movies are integrated directing into the browse menus and search functionality of Contour 2. Contour 2 does not support any 4K content, and will not stream any 4K content, regardless of Netflix streaming plan. In the Contour 2 on-screen guide, content marked with the icon will count toward your data usage. Any level of Internet service is required. You must subscribe and be logged into Netflix, to browse menus and use the search functionality. 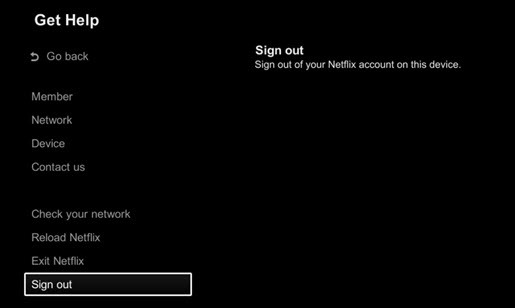 Use the following information to sign out of Netflix from the Contour 2 receiver. Access the Contour 2 Netflix App. Using the Cox remote, access Settings and press Select. Use the arrow keys to highlight Sign Out and press OK. Result: A confirmation window reads "Are you sure that you want to sign out?". Select Yes to sign out. Result: Once signed out, you are redirected to the Netflix sign on window.